Port Lincoln is located on the southernmost tip of Eyre Peninsula in South Australia, 650 road kilometres from Adelaide, or 250 kilometres by air. A picturesque seaport with a population of approximately 15,000 people, Port Lincoln has a Mediterranean climate with an average summer temperature of 24.9 degrees and average winter temperature of 15.6 degrees.Port Lincoln’s deep natural harbour is five times the size of Sydney harbour and home to the largest commercial fishing fleet in Australia. In addition to the fishing industry and extensive aquaculture activity in the surrounding areas, farming on Eyre Peninsula accounts for 50% of South Australia’s wheat, oat and barley production. Scenic coastline and National Parks surround the town, where great beaches, and pristine wilderness abounds. As a regional centre, Port Lincoln is well serviced by a wide range of facilities including, six schools, a hospital, and a wide range of professional services and retail shops. A regular air service between Port Lincoln and Adelaide is provided by the Regional Express (REX) airline group. 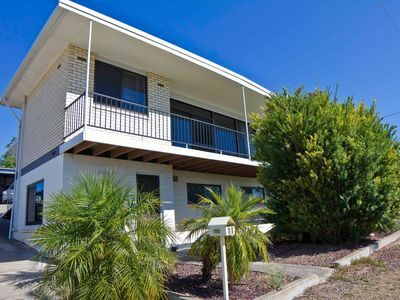 Residents of Port Lincoln enjoy a great seaside lifestyle, and with recreational pursuits such as swimming, surfing, fishing, golf, sailing, horse racing, camping, and all-manner of team sports very easy to access, it is a great place to live or invest. There are many opportunities for waterfront investment in Port Lincoln and surrounding areas, and numerous properties with beautiful sea views. For more information about the range of residential, commercial, and rural real estate opportunities available, don’t hesitate to contact one of our experienced agents. 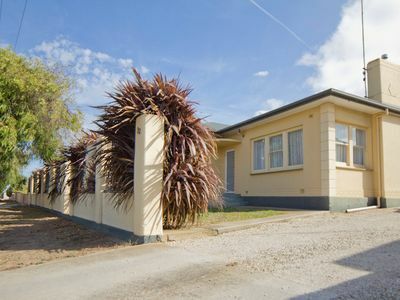 Port Lincoln Real Estate has established an office in Tumby Bay, a coastal town situated on the Spencer Gulf, on the eastern coast of Eyre Peninsula in South Australia, 45 km north of Port Lincoln. Principal of Port Lincoln Real Estate, Shylie Williams, believes Tumby Bay is a town with a bright future in the regional area of Lower Eyre Pneinsula, and openng an office within the town a positive move. Living and residing in Tumby Bay, local sales consultant Fiona Walsh, along with David Thring, will combine to provide a thorough and nformative sale or purchase real estate transaction.The town of Tumby Bay is the major population centre of the District Council of Tumby Bay, and the centre of an agricultural district farming cereal crops and sheep, as well as having established fishing and tourism industries. Since it was first settled, Tumby Bay has predominantly been an agriculturally driven town, with cereal crops, sheep and beef commonly farmed at the present. As with many towns on the Eyre Peninsula, Tumby Bay also has a well-established professional fishing industry. Tumby Bay Foreshore Park with muralLike many towns on the Eyre Peninsula, it is a popular holiday destination during the summer months. One of the major drawcards to the area is its fishing, with a wide array of fish species available, including King George Whiting and Snapper. Fishing can be done from the town jetty, the surrounding beach and rock areas, as well as from a boat, which allows access to the Sir Joseph Banks Group. In 2001, a marina was constructed to allow easy all weather boat launching for a range of boat sizes, as well as opening up new real estate options. The safe, calm waters and the white sand of the bay lend themselves to a variety of watersports including swimming, snorkelling, scuba diving and water skiing for those with access to a boat. The town has a caravan park and a number of hotels and apartments for tourists visiting the area, and has a large number of facilities and shops. The small seaside township of Coffin Bay on Lower Eyre Peninsula is 45 kilometres west of Port Lincoln. It is a pristine natural paradise set on a tranquil estuary of meandering waterways, and is surrounded by a national park. Coffin Bay has a permanent population of approximately 650 people which swells to more than 3,000 during the busy summer school holidays and Easter periods. Facilities within the township include two shops, a butcher shop, yacht club, and golf club. A small airstrip on the outskirts of Coffin Bay caters for an increasing number of charter and private aircraft. Holiday makers flock to the town to enjoy the beautiful beaches, all manner of watersports, excellent fishing, boating and four-wheel-driving. The Township of Coffin Bay is located on lower Eyre Peninsula on the shores of Port Douglas Bay and has a permanent population of approximately 650 people which swells by a further 3,000 plus people during the summer school holidays and Easter periods. The visitor is offered unparalleled scenic views of vast expanses of meandering protected pristine waterways with large bays, channels, inlets and sandy beaches providing the ideal family holiday retreat and a fisherman’s paradise with boat, surf, rock and jetty fishing. Coffin Bay boasts great services and facilities for visitors. Accommodation is available ranging from motel and 4 star holiday apartments to holiday homes, cabins and beach shacks and caravan park. Idyllic Coffin Bay is a smorgasbord of unspoiled natural inlets, bays and vast water ways with pristine waters and sandy beaches. Discovered by Matthew Flinders in 1802 and named in honour of his friend Sir Isaac Coffin, Coffin Bay is a beautiful and idyllic holiday destination surrounded by National and Conservation Parks with an abundance of wildlife, bird life and magnificent wildflowers to be seen. The exposed jagged cliffs, sand dunes, long white beaches and wild seas of the Coffin Bay Peninsula contrast starkly with the sheltered tranquil waters of the bays. Located 45kms west of Port Lincoln, Coffin Bay, where relaxing is easy has all the facilities for you and your family to enjoy nature at its best with 4WD, fabulous fishing, boating, yachting, kayaking, swimming, diving, surfing, water skiing, windsurfing, skim boarding, in fact all water sports plus walking trails, and fabulous scenery. Idyllic Coffin Bay is a must see destination. Port Neill is a small coastal town on the eastern side of the Eyre Peninsula, in South Australia about 3km off the Lincoln Highway between the major towns of Whyalla and Port Lincoln. It is 576 km by road from Adelaide. The town offers protected beaches for swimming, as well as providing a venue for fishing, boating, sailing, skiing or skin-diving. The Port Neill jetty and goods shed indicate the town’s past as a once busy seaport. Today, much of Port Neill’s economy is derived from the surrounding agricultural districts, with cereal crops and sheep prominently farmed. Like many coastal towns of the Eyre Peninsula, Port Neill is a well established tourist destination, with town numbers swelling during summer holidays. As well as its history, Port Neill offers a laid back country atmosphere and a number of recreational activities. Fishing is popular from the town jetty, the surrounding beaches and from boats, with boat launching facilities available. A number of other watersports including swimming and snorkelling are on offer in the clean sandy bay. Cummins is a town of some 700 people on the Eyre Peninsula in South Australia, 67 kilometres north of Port Lincoln. The town serves an important agricultural district on the Lower Eyre Peninsula where the rich, undulatiing country produces wheat, barley, lupins, canola, legumes and livestock which is sent by rail to Port Lincoln for export. Cummins’ grain terminal rivals Port Lincoln for size and the town also includes a number of farm machinery businesses. Cummins is only a short 30 minute drive from the magnificent fishing and surfing beaches of Coffin Bay, Port Lincoln and Tumby Bay, and the spectacular grandeur of the cliff-studded west coast.